How far would you go to save the life of your child? Owen Wright is about to find out. The enigmatic Lonely Hearts Killer has kidnapped his daughter, and is about to cure her broken heart in a permanent way! Guide Owen as he unravels the mystery of a killer who murders people suffering from a love gone wrong. Explore a 19th Century British city in all of its splendor, unwind the intrigue of the killer, and stop a whirlwind of crime that has paralyzed the people of the town. Olivia must live, and only you can save her! 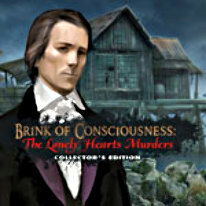 The Collector's Edition of Brink of Consciousness: The Lonely Hearts Murders includes a bonus chapter with a surprising twist, an in-game strategy guide, desktop wallpapers, concept art, and a downloadable soundtrack. -A bonus chapter with a surprising plot.